Paid search marketing is an inexpensive and scalable form of web marketing designed to connect your ads with searchers actively seeking what you provide. The smartest paid search marketing campaigns are pay-per-click, or PPC campaigns, and the logic behind them can be summarized simply: you bid for ad placement in a search engine’s sponsored links for keywords related to your business, then you pay the search engine a small fee for each click. Paying for every click may sound like you’ll end up paying a lot, but in a well-designed campaign, the opposite is true. Because your potential customers will see your ads only when they’re searching for precisely the products or services you offer, they’re far more likely than a casual browser to be at the point of purchase. And so, with the right research and a little tinkering, the paid search ads you place will actually end up earning you far more than it costs to place them. As you already know, Google and other search engines return two kinds of results to users: organic results and paid results. Appearing in the sponsored links requires entering into an auction and competing with other bidders for advertising space. So, the million dollar question: why engage in paid search advertising or hire a consultant when you can rank in Google's organic results for free? First of all, organic search marketing, AKA SEO, isn't free. It takes a lot of time, effort and knowledge to win high organic search engine rankings. Those resources are anything but free for your company. Especially for newer, less established sites, it can take quite a while to gain enough domain authority to get on the first few pages for your best keywords. And most people never click beyond the first page! In the meantime, you're just sitting around waiting for qualified leads. And entering into the Google AdWords auction isn’t as tricky as it sounds. It’s simple math. Google’s PPC platform is called Google AdWords, and though it may seem a bit complex, it’s actually designed to provide maximum ROI to everyone involved: Google, your company, and searchers. The way it does this is by rewarding the most relevant, intelligently targeted pay-per-click campaigns by charging them less for ad clicks. So the more specific and useful your ads are, the better you’ll perform. You’re rewarded for drumming up interest in your own site. Every time a search is initiated, Google digs into the pool of AdWords advertisers and chooses a set of winners to appear in the ad space on its search results page. The “winners” are chosen based on a combination of factors, including the quality and relevance of their keywords and ad campaigns, as well as the size of their keyword bids. More specifically, who gets to appear on the page is based on an advertiser’s Ad Rank, a metric calculated by multiplying two key factors – CPC Bid (the highest amount an advertiser is willing to spend) and Quality Score (a value that takes into account your click-through rate, relevance, and landing page quality). So how do you go about creating the most successful paid search marketing campaign you can? You begin with keywords. Use negative keywords to your advantage: Negative keywords enable you to filter out search terms that aren’t relevant to your products and services, so your ads won’t show up for those irrelevant searches. In the long run, this can save you a lot of money in wasteful clicks! Don’t go too broad: It’s also worth paying special attention to the long tail of search—that is, the longer, less frequent keyword phrases that actually add up to a greater volume of visits than the few most common keywords. Long-tail keywords tend to show a high degree of intent, so they can be excellent candidates for your paid search campaigns. For example, it's a good bet that someone who searches on "organic dog food free shipping" is later in the buying cycle than someone who searches on "dog food" alone. Bidding on the right keywords is only part of the paid search marketing battle. You also need to create relevant, compelling text ads. This will ensure that your ad shows up in the first place—kind of important!—but also that search engine users are drawn in to click. A high click-through rate (CTR) makes for more cost-effective paid search campaigns. You'll lower your cost per click while improving Quality Score and earning better ad positions. Highly relevant to the user's search query. Be sure your ad addresses the query directly and leads the user to an appropriate landing page on your website. For instance, if the keyword is "natural dog food," use those specific words in the ad and don't lead the searcher to a general pet food page. Eye-catching without being spammy. Include a call to action (entice them to buy your product or sign up for a free trial, for example) but don't use all caps, multiple exclamation points or phrases like "Click here." Such tomfoolery is better suited to the comments fields of political blogs. When designing a winning paid search campaign, you’ll want to ask yourself other questions as well, of course, like exactly which pages are underperforming in “natural” (i.e. unpaid) Google searches and exactly what content it’s most crucial to win attention for. As time moves forward, you’ll want to periodically review your campaign too, to make sure your original goals are being met and to weigh exactly which phrases are earning you the most love from customers. And if the keywords you originally selected aren’t working as well as you’d hoped, then it will be time to run some new ones up the flagpole and see who salutes. It takes care and a little practice, but once you get the hang of it, paid search marketing can be one of the most cost-effective and revenue-generating pieces of your marketing strategy. Why not get started today? 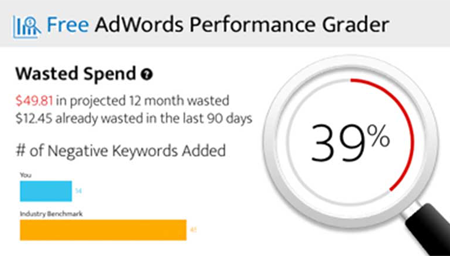 The AdWords Performance Grader’s expert analysis shows you where and how to make improvements that will improve your performance and save you money. Following PPC best practices have never been easier – it’s fast, secure, and free. Get your free performance report now.